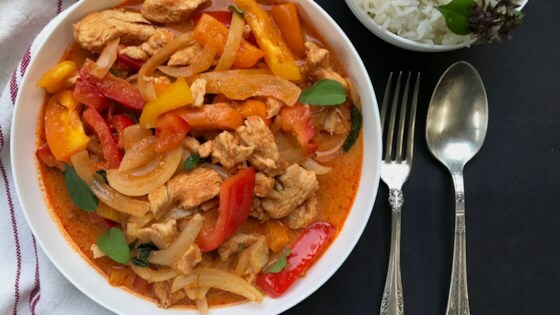 "Thai red curry chicken is a quick and delicious soup with chicken, onions, and bell peppers. Enjoy hot with jasmine rice. If you like, add Thai basil leaves." Turn on a multi-functional pressure cooker (such as Instant Pot(R)) and select Saute function. Add oil and red curry paste to the hot pot; saute for 30 seconds. Add chicken and mix well with curry paste. Pour in coconut milk. Close and lock the lid. Select high pressure according to manufacturer's instructions; set timer for 2 minutes. Allow 10 to 15 minutes for pressure to build. Release pressure using the natural-release method according to manufacturer's instructions, 10 to 40 minutes. Unlock and remove the lid. Stir in fish sauce and palm sugar. Stir in onion and bell peppers until well combined. Select Saute function. Bring curry to a gentle boil and simmer for only 2 to 3 minutes to keep vegetables crunchy. Check out this delicious and easy to make homemade chicken curry! If you prefer a thicker curry, add only half a can of coconut milk. If you are using thicker chicken breasts, increase cook time to 4 minutes. Add more red curry paste for a spicier curry.